Hippyish: Some Tangental Thoughts on "Bromance"
Some Tangental Thoughts on "Bromance"
I meant to write this yesterday and got distracted by my gaping open suitcase with its zippered maw of overstuffed doom. 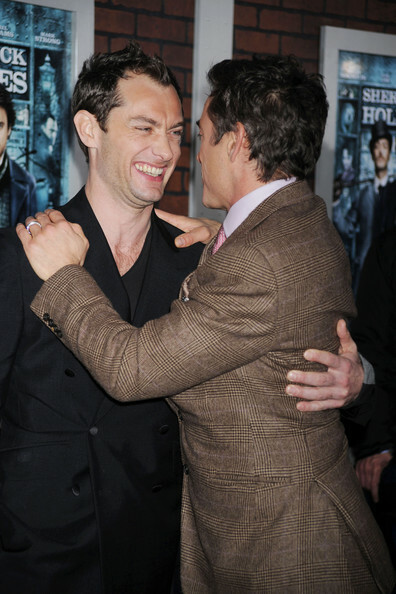 So, the new Sherlock Holmes movie. I saw it with two good friends a few days ago, and really enjoyed it. It's not a particularly smart mystery or anything, but it's a good action movie, and the relationship between Holmes and Watson is pretty great to watch. So now I'm wondering about this. Bromance strikes me as kind of the equivalent of when guys follow up an expression of affection for one another by saying "no homo" - a way of acknowledging close platonic male relationships while also distancing from or making fun of sexual relationships between men. It's close but not too close. So when Jude Law says it's belittling, he's saying that it's okay for men to have close, intimate platonic relationships, and so what if they look a bit like gay relationships? Or at least, that's how I read it. But there's no equivalent for women, as far as I know. I wrote a paper about "romantic friendships" earlier this semester, which seem to be about the same idea, but that concept doesn't seem to exist anymore. Female relationships now seem less intimate to me than what I read about for "romantic friendships" - ladies usually don't routinely kick their husbands out of bed to cuddle with their best friends anymore, as far as I know - but some degree of intimacy, maybe physically but definitely emotionally, is still expected in relationships between women, so there isn't any need for a term to specifically explain it.